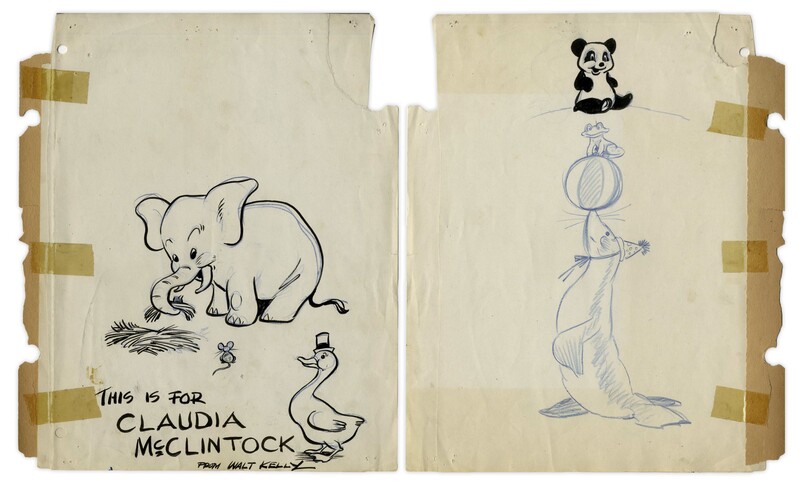 Exceptional lot of three letters signed, and two pages of illustrations by Dr. Seuss, in addition to four pages of illustrations by Walt Kelly. All letters by Seuss are dated 1957 when both ''The Cat in the Hat'' and ''How the Grinch Stole Christmas!'' were published, with Seuss here writing enthusiastically about the success of the books and considering toys and games based on the characters. 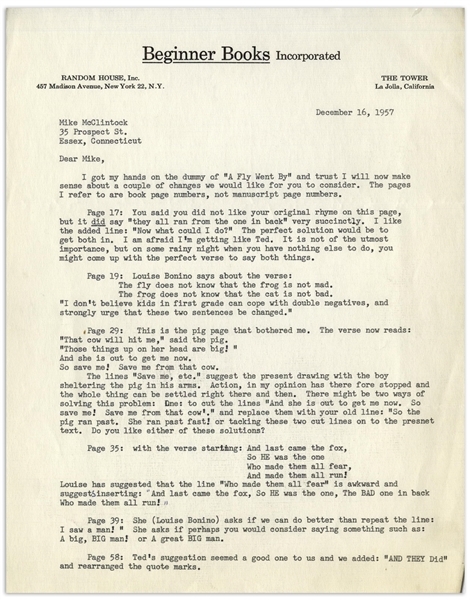 Lot comes from the estate of Mike McClintock, whose children's book ''A Fly Went By'' was published by Random House, and also includes two letters regarding the book from Random House editors (one lengthy letter is by Seuss' collaborator Phyllis Cerf). 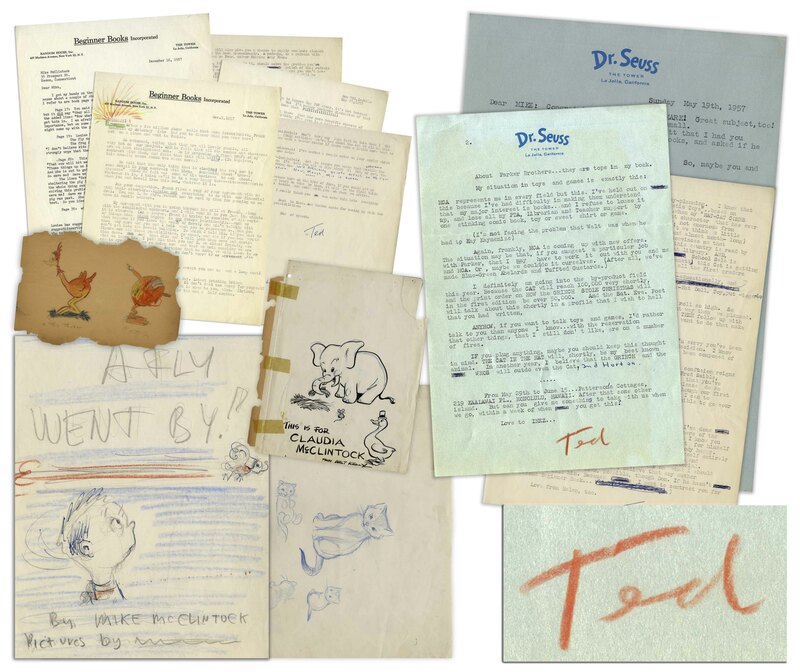 All Seuss letters are near fine, written on front sides of sheets only, and though varied in size, measure approximately 8'' x 10.5''. 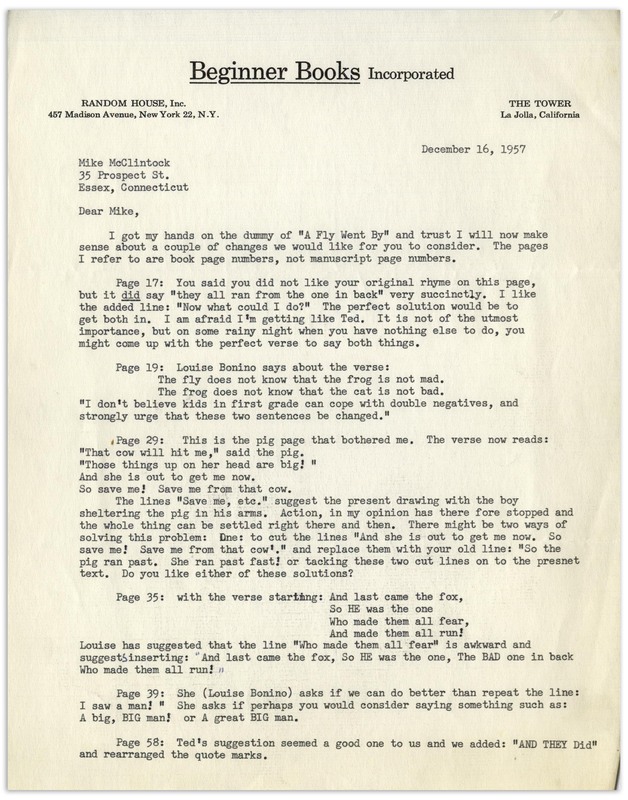 In Dr. Seuss' first letter, dated 19 May 1957 on his personal stationery, Seuss writes to McClintock, in part, ''...you picked me off Madison Ave. with a manuscript that I was about to burn in my incinerator, because nobody would buy it. And you not only told me how to put Mulberry Street together properly...(as you did later with the 500 Hats), but after you'd sweated this out with me, giving me the best and only good information I have ever had on the construction of a book for this mysterious market, you even took the stuff on the road and sold it...I hate like hell to ask for your MSS if it isn't finished. But I think I know your mind well enough to understand your intent even from the roughest notes...My situation in toys and games is exactly this...my major interest is books...and I refuse to louse it up, and lose all my PTA, Librarian and Teacher support by one stinking comic book, toy or sweat shirt or game...I definitely am going into the by-product field this year. Because the CAT will reach 100,000 very shortly, and the print order on HOW THE GRINCH STOLE CHRISTMAS will in the first edition be over 50,000. And the Sat. Eve. Post will talk about this shortly in a profile that I wish to hell that you had written, / ANYHOW, if you want to talk toys and games, I'd rather talk to you than anyone I know...IF you plug anything, maybe you should keep this thought in mind. THE CAT IN THE HAT will, shortly be my best known animal. In another year, I believe that the GRINCH and the WHOS will outdo even the cat, [handwritten] and Horton...[signed] Ted''. 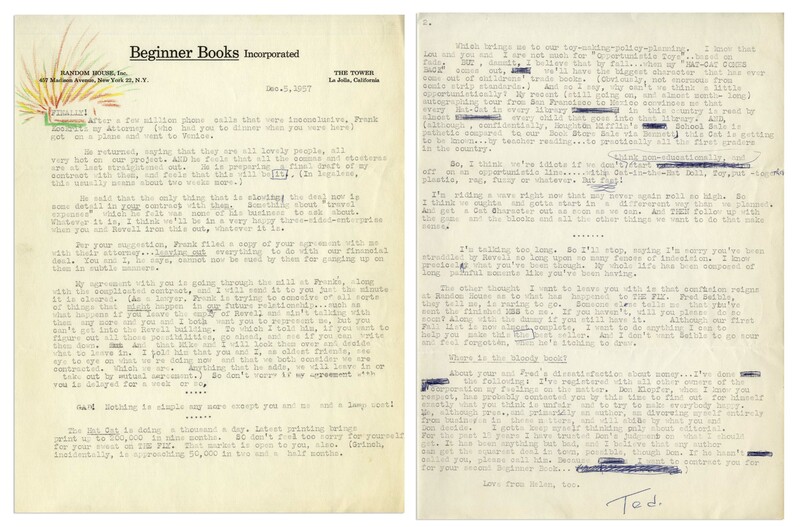 In Seuss' last letter, dated 5 December 1957 on Beginner Books stationery, he adds a colorful flourish to the first word, ''FINALLY!'' before writing two pages, largely about game opportunities for ''The Cat in the Hat''. In part, ''...The Hat Cat is doing a thousand a day. Latest printing brings print up to 200,000 in nine months. SO don't feel too sorry for yourself for your sweat on THE FLY. That market is open to you, also. (Grinch, incidentally, is approaching 50,000 in two and a half months...Which brings me to our toy-making-policy-planning. I know that Lou and you and I are not much for 'Opportunistic Toys'..based on fads. BUT, dammit, I believe that by fall...when my 'HAT-CAT COMES BACK' comes out, we'll have the biggest character that has ever come out of childrens' trade books. (Obviously, not enormous from comic strip standards.) And so I say, why can't we think a little opportunistically? My recent (still gong on, and almost month-long) autographing tour from San Francisco to Mexico convinces me that every Hat-Cat in every library int his country is read by almost every child that goes into that library. AND, (although, confidentially, Houghton Mifflin's School Sale is pathetic compared to our Book Store Sale via Bennett) this Cat is getting to be known...by teacher reading...to practically all the first graders in the country. / So, I think we're idiots if we don't think non-educationally, and start off on an opportunistic line......with a Cat-in-the-Hat Doll, Toy, put-together plastic, rag, fuzzy or whatever. But fast! / I'm riding a wave right now that may never again roll so high. So I think we oughta and gotta start in a different way than we planned. And get a Cat Character out as soon as we can. And THEN follow up with the game and the blocks and all the other things we want to do that make sense...[signed] Ted''. 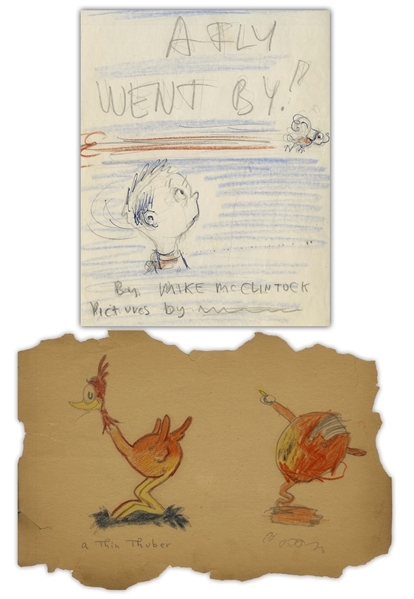 Lot continues with several illustrations by Dr. Seuss and Walt Kelly, comprising: (1) Seuss' draft illustration (referenced in his second letter) for cover art for ''A Fly Went By! '', with a child's face following a dashing fly. Measures 6.25'' x 8''. Folds, else near fine. (2) Two drawings, at least one certainly done by Seuss: what he labels ''a Thin Thuber'' that resembles an ostrich. Page measures approximately 10'' x 7''. Closed tear just touching the Thuber and toned with chipping to edges; very good condition. (3) Four pages of illustrations by Walt Kelly, Disney animator and creator of ''Pogo'', inscribed on the first page ''This is for Claudia McClintock from Walt Kelly''. 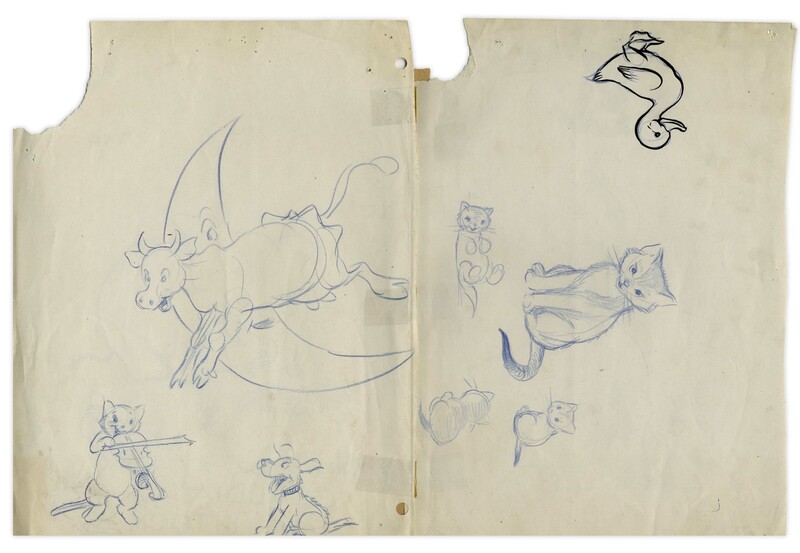 Illustrations include an elephant (resembling the character ''Dumbo'' which Kelly worked on), a mouse, ducks, a cow jumping over the moon, a dog, several cats and kittens with one playing the violin, a teddy bear, and a seal balancing a frog on a ball! Pages measure approximately 8.5'' x 11''. Tape on margins and some chipping to edges, but illustrations remain bright. 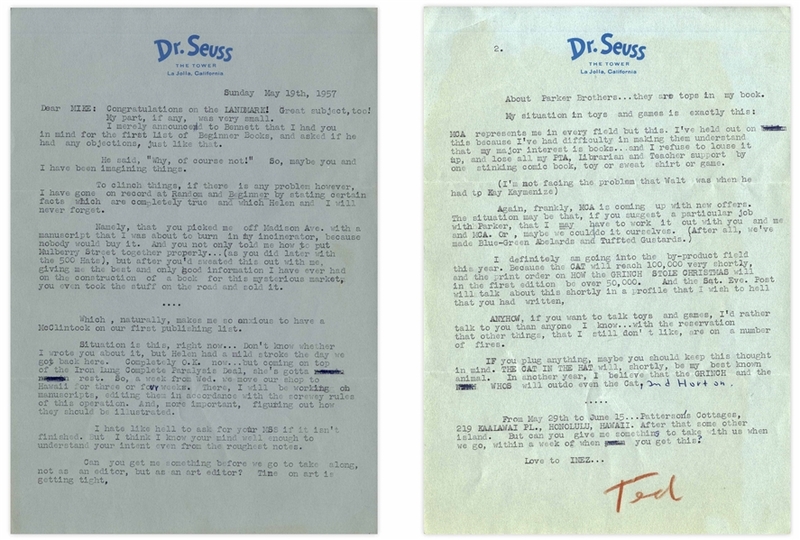 A fantastic lot with unusual and personal content from Seuss just as his most successful books were gaining worldwide notoriety.